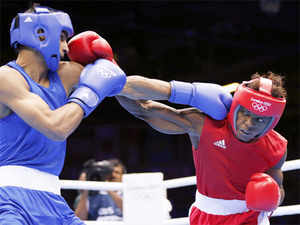 LONDON: Indian boxer Jai Bhagwanput up a power-packed display to become the second Indian pugilist to romp into the pre-quarter finals of theOlympic Games boxing event at the ExCel South Arena on Sunday. After Beijing Olympics bronze-medallist Vijender cruised into the pre-quarters on Saturday, it was Bhagwan's turn to take the spotlight as he demolished Andrique Allisop of Seychelles with a 18--8 verdict in the men's lightweight (60 kg) category. The 26-year-old Bhagwan dominated the contest from the word go as he unleashed a flurry of punches from the word go to keep his opponent under pressure. Bhagwan, who was in blue, took the first round and second rounds with identical scores of 7-3 and then put matters beyond his opponent by clinching the third round 5-2. "I was very relaxed. I had been looking forward to the Olympics for a long time and I am happy that I have started it well. It is a great honour to represent India at the Olympic Games," Bhagwan said after his bout. On the crowd support during his contest, he said, "There were many Indians in the crowd and they love us and that makes me happy," he said. Allisop was not unduly perturbed by the defeat and reckoned it was a good learning experience for him. "He had more experience but I am satisfied with my performance. After all, it is my first Olympics and I am only 19," he said. The Indian relied on his height to outpunch his rival repeatedly and was equally adapt in defending whenever the Seychelles boxer managed to attack. Realising that he was lagging to far behind, Allisop tried make a last-ditch effort to narrow down the margin but to no avail. Leading 14--6 in the third round, Bhagwan adopted a cautious approach but never let go his grip over the bout before winning the decider. Bhagwan will now face Gani Zhailauov of Kazakhstan in the pre-quarterfinals. Shiva Thapa is the lone boxer to have lost in the opening round.